Here are some tips on how to clean vomit, remove the stains and banish lingering odors caused by the unavoidable accident of an animal or child suddenly vomiting. Note: Old stains and stains that have been set by heat are in the "difficult-if-not-impossible" category. That's why it is so important to act quickly after the accident occurs. 1. Remove as much of the vomit as possible from the carpet (or whatever area ) without spreading the mess. 2. Always sponge such stains promptly with cool water. Steps: 1. Remove as much of the vomit as possible from the carpet without spreading the mess. 2. Pour dry cleaning fluid over the stain. 3. Blot the stain with a dry, white cloth. 4. Apply a small amount of mild liquid detergent to the stain. 5. Blot again with the cloth. 6. Flood the stain with water. 7. Blot again with the cloth. 8. Pour a small amount of ammonia over the stain. 9. Blot again. 10. Apply a little more detergent to the stain. 11. Blot again. 12. Flood the area with water. 13. Blot one last time. Additional tips on how to clean vomit 1. Always test the cleaning solutions on an inconspicuous part of the carpet before using them on a large area. 2. Use a white cloth rather than a colored one to prevent any dyes from coming off on the carpet. 3. As you blot, keep turning the cloth so that you are using a clean, dry section to pick up the stain and the cleaning fluids from the carpet. Don't rub. 4. If using a brush to help clean the stain, always brush from the outer edges of the spill inward to prevent the stain from spreading. Being a parent or a dog or cat owner means you are going to have to clean up vomit from your floor at some point, probably more than once. When the crime has been committed on a carpeted area, it's usually possible to restore the scene to its original condition. Read all the tips given and decide which one works best for you. One last tip: In a spray bottle, make a solution of 1/3 alcohol, 1/3 white vinegar and 1/3 cool water. Use this solution as the cleaning agent. 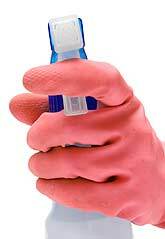 It generally works very well and negates the use of chemical cleaning agents.